Real pool balls, cue stick, chalk, felt surface, and rack are included for the many ways to play Standard Pool, Trick-Pool™, Conventional and Trick-Bowling, Bank-Bowl, Billiard-Bowl. Includes 6 numbered stunts, one for each pocket, to play Trick-Pool. (plays like miniature golf on the pool table). 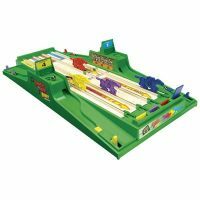 Also has a removable, reversible vinyl Multi-Game surface to play checkers, chess and backgammon on one side and bowling on the other. The legs to the SUPER POOL table can be removed for easy storage. Bowling can be played as a conventional game of bowling, as the new Bank-Bowl or as Billiard-Bowl. The Bank-Bowl and Billiard-Bowl games use the cue stick to bank the ball off the table rails into the bowling pins. Rotational stunts make the bowling games more interesting. 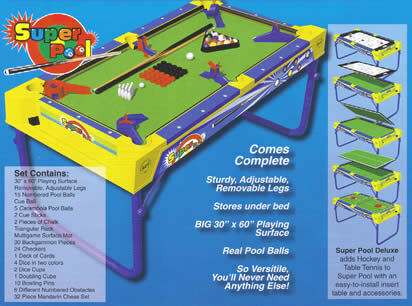 Trick-Pool™ plays like miniature golf on the SUPER POOL table. There are 6 numbered stunts, one for each pocket.